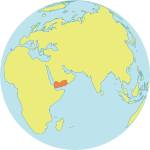 SHABWA, Yemen – Three months after conflict erupted in Yemen, violence is intensifying across the country, according to United Nations reports. Over 2,800 people have been killed, and over a million people have been internally displaced, with many forced from their homes by armed clashes, shelling and airstrikes. Women have been disproportionately affected by the conflict. Yet their access to essential services, livelihood opportunities and protection has been complicated by existing gender inequalities – including pervasive gender-based violence. 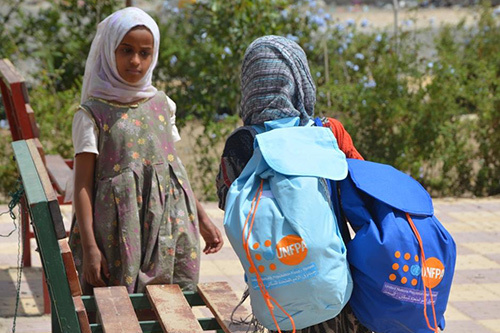 These conditions were cast into sharp relief several weeks ago, when the Yemeni Women’s Union (YWU), a UNFPA-supported organization, performed an assessment at Al-Wahda, a school in south-eastern Yemen that had been converted into a shelter. There, the workers noticed that Arwa*, a middle-aged woman, was walking with great difficulty. When they asked her how she had been injured, she burst into tears. After Arwa's father died, her brother forced her to marry his friend, a man who beat her relentlessly throughout their marriage. The abuse did not stop after they had children, or when she recently became pregnant, or when war arrived at their doorstep. The family was forced to flee their home, and Arwa struggled on the long walk to find shelter – yet even after they arrived at Al-Wahda, she was not safe. Her husband demanded that she ask the school supervisors for money. When she refused, he beat her viciously in front of their children. She had been bleeding for two days, but was unable to seek medical care. “We cannot go outside of the school as the gunfire is nonstop,” she said. The YWU workers brought her the Al-Ribat medical center, but it was too late. Arwa lost her pregnancy. When the workers spoke with her husband, he claimed she had simply fallen on the ground, causing the miscarriage. Violence is one of the most significant problems facing women in Yemen. In the country’s 2013 demographic and health survey, 92 per cent of women said violence against women most commonly occurred in the home. The current conflict has worsened conditions for women. Many are struggling to support large families, their husbands having gone off to fight. Many others have been displaced, with little access to health care, education or work opportunities. Yet, as Arwa’s story shows, the mass movement of people into shelters has also helped to reveal cases of gender-based violence, bringing the problem to the attention of health and social workers. With UNFPA support, YWU is providing a range of assistance to women affected by the conflict – from shelters and the distribution of dignity kits to psychosocial counselling and essential health services. Arwa was left with medication to lessen her pain, and she was referred to psychosocial counselling services at the shelter. YWU also worked with the shelter’s supervisors to ensure her husband would be monitored to prevent further abuse. Arwa was informed of her option to take legal action against her husband. If she chooses to do so, YWU will work with UNFPA to provide legal assistance. She has not yet decided what she wants to do.